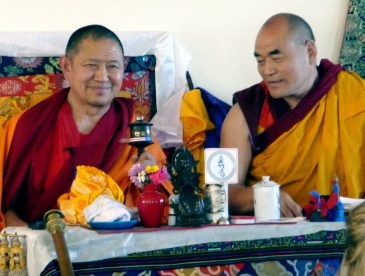 "With bodhichitta as our motivation, to nurture and sustain RigDzin Dharma Foundation, a Vajrayana Buddhist Center, as a place of refuge, support, and education for the spiritual needs of individuals, in particular those with an interest in Buddhist teachings and practices of the Drikung Kagyu tradition, as taught by His Eminence Garchen Rinpoche and Venerable Traga Rinpoche, with an openness to all Buddhist traditions." This statement puts the ideals we strive for as a sangha and a community into words. Tibetan Buddhism offers a vast and profound body of teachings and spiritual practices that date back more than 2,500 years to Shakyamuni Buddha and, remarkably, have been passed down in an unbroken lineage to the present. At the core of the teachings is a deep awareness of the nature of suffering and an emphasis on loving kindness and compassion. Through practice we come to recognize the profound interconnectedness of all sentient beings and dedicate our efforts to their liberation from the cycle of samsara or death and rebirth. Tibetan Buddhism welcomes the participation of individuals from all faiths and spiritual paths. His Holiness the Dalai Lama has said that we do not need to abandon our own spiritual background. Rather, we need only use the teachings and ideals we find helpful and meaningful in the context of our own lives. Making these teachings available to everyone in a form they can use and relate to is the ultimate aim of RigDzin Dharma Foundation. Always feel free to call us to learn more or to arrange a visit. Or stop during our open hours. People from any and all spiritual or religious backgrounds are welcome.